Pete Townshend has announced dates for a short US run of his Classic Quadrophenia stage show this fall. The project sees The Who guitarist create a new orchestral version of the band’s 1973 concept album based around lead character Jimmy’s search for an identity amongst the mods and rockers in mid-60s Brighton. Billy Idol, Alfie Boe and a full symphony orchestra and chorus will join Townshend for the four-show run, which will open at the Tanglewood Music Center in Lenox, MA on September 2 before playing two nights at The Metropolitan Opera House in New York and wrapping up at the Greek Theater in Los Angeles, CA on September 16. The Boston Pops Orchestra will join the lineup for opening night in Massachusetts, while Robert Ziegler will conduct the New York and Los Angeles performances. 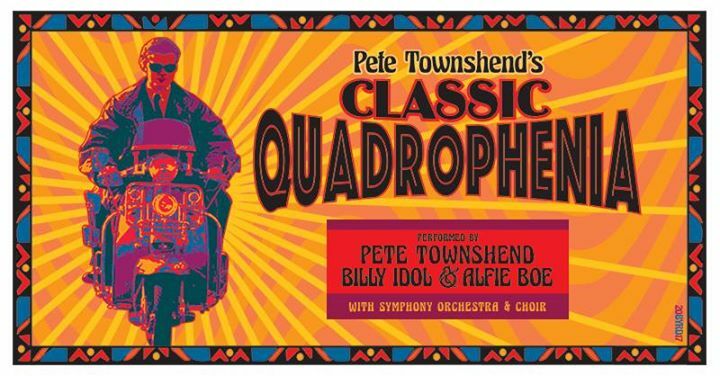 “Thrilled to be joining Classic Quadrophenia with Pete Townshend and @AlfieBoe!,” tweeted Idol. A portion of proceeds from the Greek Theatre performance will benefit Teen Cancer America, a charity long supported by The Who. A fan club presale starts June 7 at 10 a.m. local time with other presales available next week; general public tickets on sale June 13 at 10 a.m. local time via Ticketmaster. Townshend released Classic Quadrophenia on CD in 2015 in sync with its premiere at London’s Royal Albert Hall, where he was joined by Boe alongside The Royal Philharmonic Orchestra conducted Zeigler and the London Oriana Choir; the performance was later issued on CD and DVD. Upon its original release, “Quadrophenia” peaked at No. 2 on the US Billboard Pop Albums chart on its way to US sales of more than 1 million copies. The Who performed “Quadrophenia” in its entirety on a 2012-13 tour of North America and Europe. The 2017 shows follow the band’s summer tour of North America, which begins in Quebec City on July 13 and runs to August 16 in Lake Tahoe, NV before a series of South American dates in September – including an October 1 show in Beunos Aries, Argentina opening for Guns N’ Roses.